Ahead of Dave Haslam’s autobiography Sonic Youth Slept On My Floor and a Q & A session at the British Music Experience, Getintothis’ Banjo chatted with him about moving from post punk to dance, losing the safety net and more. There is a Bill Murray film called The Man Who Knew Too Little, where Murray’s character gets mistakenly caught up in a spy ring and triumphs over the bad guys only because he knows nothing about what’s going on, believing the whole thing to be nothing more than a game. Reading Dave Haslam’s autobiography puts me in mind of this character. There is a wide eyed, innocent, almost ingénue like charm to the way Haslam comes across in his book, almost chancing upon scenes and places, finding himself in the right place at the right time and succeeding because of a lack of guile rather than following a plan. Dave Haslam is an everyman made good, he is a nice guy who has won the game. As a teenager, Haslam got caught up in punk and, more pertinently, post punk, catching the likes of The Au Pairs and The Pop Group. Moving to Manchester, he found himself in the perfect place and at the perfect time for a music fan. 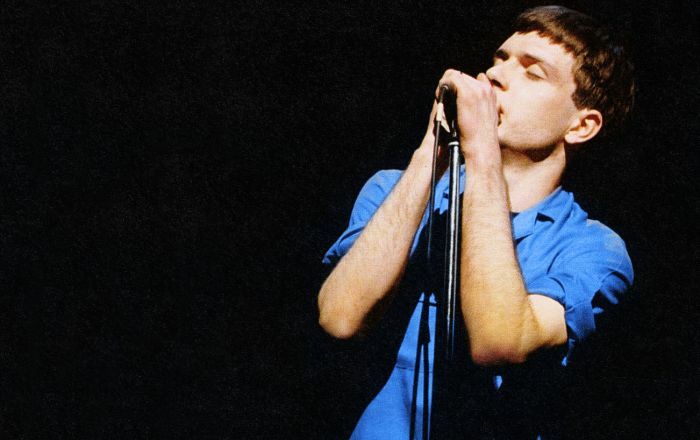 Soon he became heavily invested in the city’s music scene, with the likes of New Order and A Certain Ratio, staying with the city’s musical heroes through The Smiths’ years and into Madchester. Haslam was not content to be a mere spectator though. His fanzine Debris soon garnered attention and led to interviews with lots of Manchester’s musicians and residents, also bringing him to the attention of the NME, who he wrote for as a freelancer. His love of music led him to DJing, soon earning a residency at the Hacienda, then still a struggling, usually half empty and cavernous venue. Change was just around the corner however. Haslam recalls the first records coming over from America’s little known underground House scene. The Hacienda became one of the few clubs outside the USA where people could go to hear this new kind of music. One of the book’s highlights is as Haslam recounts his view from the DJ booth of the change that spread through the Hacienda’s clientele. From a small pocket of people, the ripples from the Ecstasy and Dance fans slowly spread from one side of the club to the other, each week seeing new converts to the cause. The revolution had begun and both the Hacienda and Manchester would never be the same again. The end for the Hacienda, when it came, is as sorry a story as has ever been told. Guns, gangsters and violence brought the club’s summers of love to an end. But, proving you can’t keep a good man down, Haslam has gone on to DJ across the world, spreading his joyous music to thousands of people. Ahead of the publication of his autobiography, Getintothis spoke to Dave Haslam to find out more about his journey from post punk to the many genres of Dance music. Getintothis: Why do you think it is that a lot of people went from punk or post punk into dance music? Musically the two have little in common. Dave Haslam: ‘I think quite a lot of post punk bands enjoyed the slightly dubby sounds of a lot of post punk, think of PiL into 23 Skidoo or The Pop Group and then there was the whole interest in electronica and drum machines. I remember hearing electro, the hip hop version of electro, not the house version, hearing Hip Hop Be Bop (Don’t Stop) by Man Parrish and to me that seemed like the sort of record I liked, it didn’t seem like a revolutionary record to me. Getintothis: Did you become aware at some point that this new music you were starting to play was starting to take over and had become something new? Dave Haslam: ‘The newness of it appealed and the trickle became a tidal wave by, I would say, the middle of 88. All the nights in the Hacienda went in slightly different directions at that point, but for me on a Thursday I was still able to mix techno with hip hop, with the industrial or electro side of indie. There were some people who were more purist about it; there was Mike Pickering on a Friday who played entirely House and Techno and there wasn’t really any crossover between the audiences. Getintothis: I remember talking to [chillout DJ] Mixmaster Morris back in the 90s and he was telling me that he had a poster on his wall of a bonfire that was made with guitars. He took against guitar music to such an extent that he was happy to see it go up in smoke and he was certain that Dance music would wipe guitars off the face of the earth. Dave Haslam: ‘The thing for me is, if you read the book you get a sense of how both my life and the world changed over the decades. There’s a quote in the book from Muhammad Ali who said that ‘A man who views the world the same at fifty as he did at twenty has wasted thirty years of his life’ and so I change, my playlist changes, the world changes and the music that seems to matter changes. And I love that and embrace that. Getintothis: Do you find that as you grow older you have lost faith in the power of music to change people? 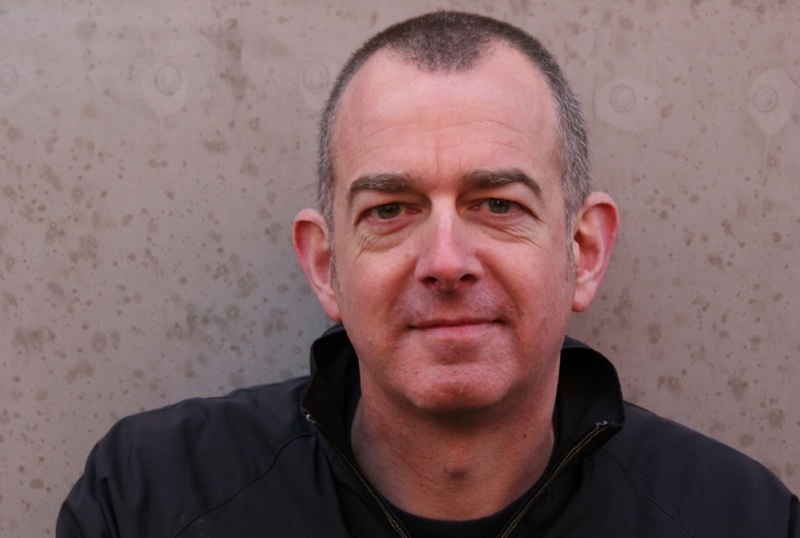 Dave Haslam: ‘I think I have it even more. In the 80s, music mattered a lot to me, but I thought that was just me and the crews I hung out with. There are some people to who music is just wallpaper, and that’s fair enough, they have other stuff in their lives, but for me it was not quite everything, but close to being everything. I think that, by the end of writing the book, in a way to do with the Bataclan attack and the Manchester Arena attack. The live gig at the Bataclan and the live gig at The Arena were targeted by Isis and to me, trying to understand the mindset of Isis, they must somehow believe music to be an important thing in our society, that music is such an important thing to us they must somehow feel threatened by it. And following those attacks, music became part of the healing process, so actually if you’d asked me that question five years ago I might have been a bit more cynical. Getintothis: You make it sounds as if music fulfills the same purpose as religion when you talk about it like that. Dave Haslam: ‘Well we’re not a religious people really, but that doesn’t stop us being spiritual or wanting to enjoy and be overwhelmed by communal experience. And also there is a redemptive power in music. Another example would be the way that Joy Division became New Order. I think it’s such an amazing story and for me it is kind of symbolic of how music can be important to people and change people and give people something to hang on to. And not just the people in New Order, but the people around them and the people who were part of the Joy Division story. In a way they find a kind of redemption through the band that came out of the ashes of Joy Division. There’s something very powerful about that story and it’s almost an intense reflection of the way we all are with music. Getintothis: So you actually found something out about yourself by writing the book? Dave Haslam: ‘Yeah. I was just writing about myself, and writing honestly, but I talk about how music was never just music to me, when I was a teenager, music is what opened up all those other doors into the world of ideas, the world of art & culture. And I think that probably still happens, but it’s certainly true of my generation. When I first met people like Pete Wylie and Jayne Casey, I realised that it was the same for them, and it was something that connected me to them, particularly to Wylie, that music was a way into things. Getintothis: In your book, it seems that one thing leads to another, which leads to another. Did you have any kind of plan or did you just take advantage of opportunities that were there? Was there an ambition? Dave Haslam: ‘Writing the book I kind of realised I was making opportunities for myself, but also I was very reliant on opportunities arriving and me being a bit more passive in that career structure, rather than cutting a swathe through the world, like some kind of an all conquering super hero, it wasn’t like that. I was very reliant on some people, like Tony Wilson, for example, being the kind of person who would open up an opportunity. So it was kind of a mix of things, but because I’d always been comfortable in the outer reaches of music, in those outer reaches you never know what’s going to happen. If you’re in the mainstream, you know that a great ballad will always be a great ballad and a novelty song will always be a novelty song, there’s are some basic rules which you know will always apply. So if you’re a radio DJ and you keep smiling and playing songs from the top 40, you’ve got a career. But on the outer reaches you have to be used to everything changing, or at least evolving and new things happening. You have to be open to things happening, so you can’t really plan ahead. If you stop doing that, you stop being open to what’s happening in the world. Getintothis: You do get people who stick with the music that was happening when they came of age. 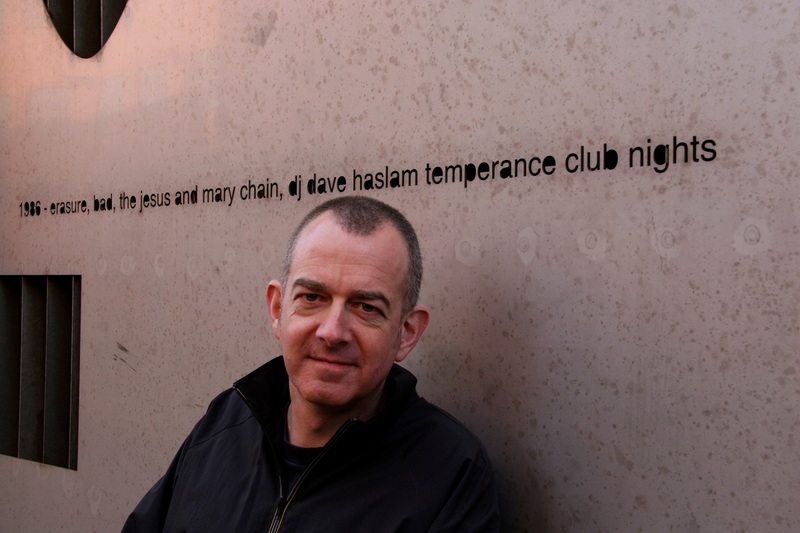 Dave Haslam: ‘I don’t mind that because I think that when you’re young you are particularly susceptible to new experience, before you maybe settle down, get a proper job and a mortgage and all that, you glorify those years of supposed freedom when you were discovering all this great music and you were on the dancefloor or down the front at gigs and your music tastes were being shaped. That is a glorious period for people and they just don’t have the need to move on from that. I did, but that doesn’t mean that the music I heard when I was 15/16/17 isn’t still really important to me, most if it is. I think everyone’s life is soundtracked by music to a certain extent. Getintothis: Listening to some of your Hacienda mixes, there is a real infectious joy to the music. How do you feel about how Dance music developed over the years? Dave Haslam: ‘Well myself, Mike Pickering, Graeme Park, Jon Dasilva, I think we were all much more eclectic than Dance music DJs are now. There wasn’t the same need from us or the audience for pigeonholing and that gave us a lot of freedom. But I think Dance music has progressed in lots of great ways. But the one thing I sometimes regret is that everyone has retreated into genres. Which I can understand because if you like bog standard global EDM you’re not going to like minimal techno. But it’s a bit of a shame that the barriers are really down between dance music genres. But this has been going on for more than 20 years, I remember talking to Paul Van Dyk at the height of Trance music; The Fugees first album had just come out and I said to Paul, as one music fan to another, ‘what do you think of The Fugees album?’ and he said ‘it’s great.’ And I said to him ‘are you going to be playing anything off it in your set?’ and he said ‘no, it’s not what I play. And people who pay to hear me don’t expect me to play that kind of music, they come to hear Paul Van Dyk music.’ I understood what he was saying on a sort of brand level, but I thought I don’t really want to be in that situation. Dave Haslam: ‘I’m working on a project that is will be a live performance. This is alongside all the other things I do, I like doing the onstage interviews, I love DJing, I like writing. All that stuff I want to keep on doing until I drop. But I have got this thing that I want to do that’s halfway between DJing and performance art. It’s probably by far the artiest thing I’ve ever done and it certainly won’t go top 20. And Paul Van Dyk won’t be playing it. [laughs]But I already have my debut live performance penciled in so now I have to be ready for that and challenge myself. If you get to the end of Haslam’s autobiography, you may think that he doesn’t need anything else to make his life more exciting. He has been lucky enough to have spent his life wisely and found himself at the centre of extraordinary times. Will this continue, will he still be spreading his love for music across the world in the future?